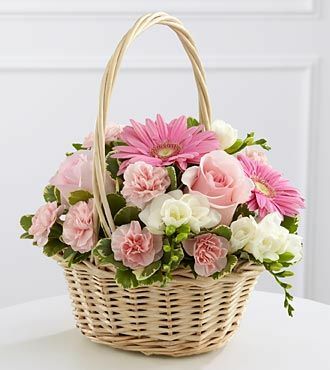 The FTD Enduring Peace Basket is bursting with grace and sweet elegance to honor the life of the deceased and offer comfort to the friends and family suffering from their loss. White freesia pop against a bed of pink gerbera daisies, roses and mini carnations, gorgeously acceented with lush greens and arranged in a small oval whitewash willow basket, to create a beautiful way to convey your deepest sympathies. GOOD basket includes 9 stems. Approximately 8H x 10W. BETTER basket includes 13 stems. Approximately 9H x 13W. BEST basket includes 17 stems. Approximately 10H x 14W.